Jimmi Simpson stars in PERPETUAL GRACE, LTD. as “James,” a disgraced firefighter who seizes a chance, illicit opportunity to reverse his life’s worsening course. When his plan veers dangerously off track, James must call on strength and fortitude he did not know he possessed in order to survive it all. 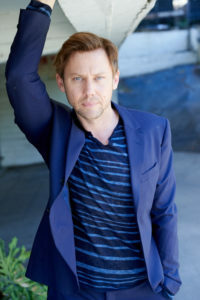 Jimmi Simpson is an immensely talented and versatile actor with a gift for taking on challenging roles and bringing dynamic characters to life on and off screen. As he fearlessly evolves his body of work with each new project, Simpson is fast becoming one of today’s leading talents across television, film, and the stage. In the EPIX modern noir series, Simpson co-leads opposite Sir Ben Kingsley. Simpson plays James, a disgraced firefighter who seizes an illicit opportunity to reverse his life’s worsening course. When his plan veers dangerously off track, James must call on strength and fortitude he did not know he possessed in order to survive it all. Up next, Simpson can be seen in the film “Under the Silverlake,” in which he will play Allen. Most recently, Simpson can be seen in the Netflix series “Black Mirror: USS Callister” where he plays Walton. “USS Callister” follows a woman who wakes up on a “Star Trek”-esque ship where the crew praise their all-knowing and fearless captain, played by Jesse Plemons. Additionally, Simpson stars in USA’s limited series “Unsolved The Murders of Biggie and Tupac,” where he plays Detective Russell Poole. “Unsolved” digs into the murders of iconic rappers Tupac Shakur and The Notorious BIG. Simpson also stars in the HBO series “Westworld,” which is in its second season. Simpson stars opposite Anthony Hopkins, Ed Harris, and Evan Rachel Wood. The twisted sci-fi thriller is a fresh take on Michael Crichton’s 1973 film by the same name. The series, which garnered multiple 2017 Screen Actors Guild and Golden Globe nominations, tells the story of a futuristic theme park that dives into a dark odyssey about the dawn of artificial consciousness and the future of sin. Simpson stars as William, a visitor to Westworld, through whom we experience the world and its various characters and scenarios. In addition to “Westworld,” Simpson starred alongside James Purefoy, Michael Kenneth Williams, and Christina Hendricks in the SundanceTV & AMC miniseries, “Hap and Leonard.” His riveting portrayal of Soldier, the mysterious and psychopathic drug dealer, earned him rave reviews. Earlier, Simpson received ensemble cast recognition with a 2015 & 2016 Screen Actors Guild nomination for his role as Gavin, an enigmatic computer hacker turned reluctant FBI informant, on the Netflix award-winning series “House of Cards.” Simpson also held a reoccurring role on the long-running FX comedy “It’s Always Sunny in Philadelphia” as Liam McPoyle. Simpson’s previous television credits include a recurring role in the final season of Aaron Sorkin’s HBO series “The Newsroom” as the love interest to Allison Pill, along with starring in the A&E drama series “Breakout Kings,” and he appeared numerous times on “The Late Night Show with David Letterman” as the memorable Lyle the Intern. Not only is Simpson a master of character on-screen, he also owns the stage with his compelling performance in the Off-Broadway play “Empathirax.” The play followed a couple as they take the leap to eliminate all boundaries between them, promising the audience an instant emotional intimacy with each character. Simpson also previously starred on Broadway opposite Hank Azaria in the title role in Aaron Sorkin’s play “The Farnsworth Invention,” for which he received a Theaterworld Award. Additionally, he received a number of nominations and awards, including the LA Drama Critics Circle, for his performance in “Trevor” at the Circle X Theatre Company in Los Angeles. Simpson currently resides in Los Angeles.